On February 27th 1991, after 100 hours of ground war, US President Bush declared a ceasefire. At this point, the Iraqi military had been driven from Kuwait, and Allied forces were deep inside Iraq. At the time of the ceasefire, Shiites and Kurds within Iraq, encouraged by American radio broadcasts, rose up against Saddam Hussein's regime. With the Iraqi military greatly weakened, the regime's loyalist Republican heavily bombed, and with much of the population in open revolt, few outside observers expected to Saddam Hussein to be able to stay in power for too much longer. Inspite of these predictions, Saddam Hussein was able to defeat the revolts and retain power. In retrospect, the fact that the international Coalition did not go on to capture Baghdad and overthrow the Ba'athist regime, has sometimes been heavily criticized - but the reality is that very few countries in the Coalition would have been willing to do so. Because Saddam Hussein remained in power, Britain and the United States had no choice but to continue to maintain significant military forces in the region for the next few years. Allied forces attempt to enforce United Nations provisions, particularly those relating to no-fly-zones for Iraqi military aircraft, the continued economic embargo on Iraq, and disarmament. 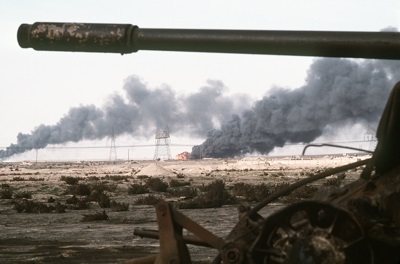 During this period, there were repeated confrontations between Allied and Iraqi forces. Finally, in 2003, after a changed political situation following the September 11th attacks on the United States, and yet another crisis over Iraqi disarmament, Allied forces, led by the United States and Britain, invaded Iraq and overthrew Saddam Hussein's regime. Saddam Hussein himself was eventually tried, convicted and then executed by his own people on December 30th 2006.